Today is Elizabeth Craft Designs first Designers Challenge for 2018. The Theme this month is “You Fill My Heart” and we were to create a card suitable for Valentine’s Day. My card today is a Valentine I created using Joset’s Heart Cut Outs die set along with Susan’s Garden Rose 2 and Oval Grapevine Wreath. To see all the creations by the design team, go to the Elizabeth Craft Designs Blog at this LINK. The winners will be announced on Friday, February 1st on the Elizabeth Craft Designs blog. Here is how my card was created. Card base 8-1/2″ X 5-1/2″ front of card embossed. 2. Using White Soft Finish Cardstock with Clear Double Sided Adhesive on top cut 1 heart with die cut hearts from Joset’s Heart Cutouts die set and 1 solid heart saving little hearts as well. Coat top of heart that has cutouts with Cool Diamond Silk Microfine Glitter burnish in with finger. Coat solid heart and little hearts with True Red Silk Microfine Glitter burnish in with finger. Attach white heart on top of red heart using Kids Choice Glue. 3. Using Els van de Burgt Love Sentiments die set die cut “Be My Valentine” from White Soft Finish Cardstock with Clear Double Sided Tape on top. Coat with True Red Silk Microfine Glitter burnish in. 5. Cut 1 set of Garden Notes Ladder Fern from green cardstock use a little distress ink to shade give a little shape by using small ball tool and molding mat. 6. Assemble Card by Attaching grapevine heart to left side of card front using Kids Choice Glue. Place glittered hearts in center of grapevine wreath attaching with dimensional tape. Add ferns, roses and leaves on left side of heart using Kids Choice Glue. Add little hearts and “Be My Valentine” on right of card. Hope you have enjoyed this tutorial today. 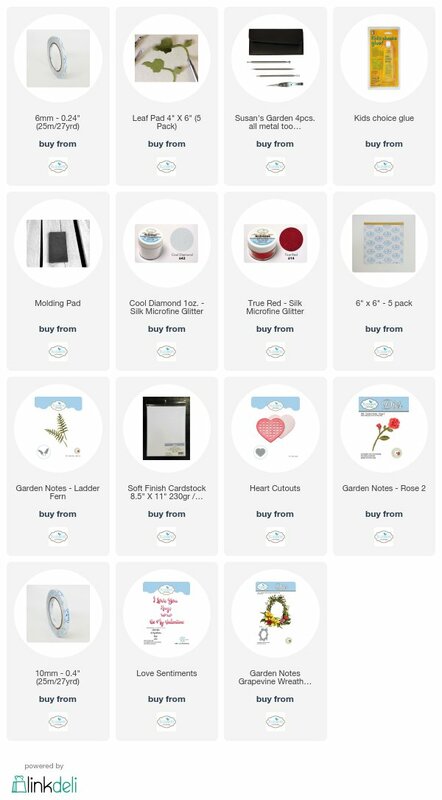 To purchases any of these Elizabeth Craft Designs products just click on the picture and it will take you right there. Be Sure to comment on their blog to enter to win. Good Luck! Very nice. Clever way you shaped the wreath. Love this card. Roses are so life like and so is the wreath. A touch of glitter, perfection! Thank you so much Marlene for your kind words!